Of course I will put Mr. Strickling's letter in the Secretary of War's hands and I am sure that he may count upon its being very respectfully considered. It was a real pleasure to hear from you and I am warmly obliged to you for sending me your very pointed reply to Doctor Eliot. 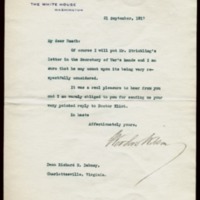 Wilson, Woodrow, 1856-1924, “Woodrow Wilson to Richard Heath Dabney,” 1917 September 21, WWP20526, University of Virginia Woodrow Wilson Letters, Woodrow Wilson Presidential Library & Museum, Staunton, Virginia.